This is more painful than getting dumped. 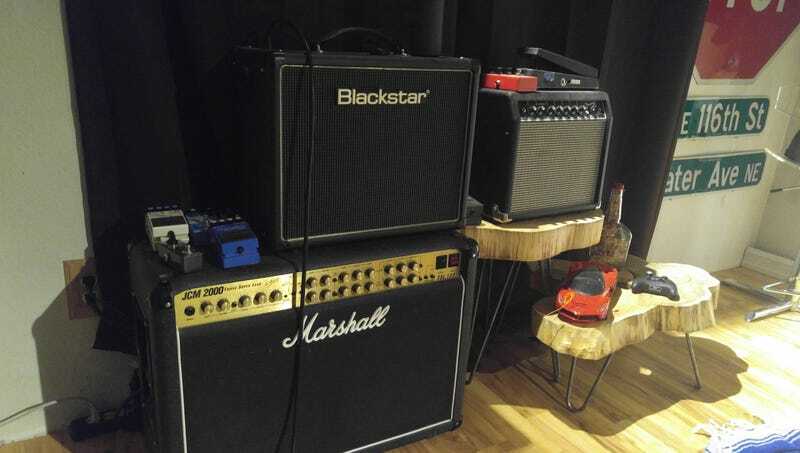 The Marshall was my first “real” amp... But it’s been sitting unused ever since tube and/or soldering problems made it unusable a year ago. Selling way below value to fund my car projects. Bittersweet. every musical instrument and amp I’ve sold I’ve regretted, and this will surely be the same. Unfortunately I can’t keep everything. There was the Ibanez rg—hardtail—that I outfitted with Seymour Duncan blackouts, locking tuners, a new bone nut and a plek’d + scalloped fretboard. Absolute monster of a guitar, to this day I haven’t found a better shredder under 2k. Also the only guitar I’ve ever bought new. I went through an epi Les Paul which I was fully expecting to hate, but lo and behold, I loved it. Kept me sane while my forever guitar (American mockingbird) was in a state of disrepair. Sold it to a friend when I decided to trim down to two guitars. And now this. Tomorrow I’ll drive 90 minutes to metaphorically cut off my arm for a few pieces of paper. Life, oppo.